Britain’s Elfyn Evans stars in a special viral video produced to promote the history-making new Great Orme Llandudno street stage, the spectacular finale to this year’s Dayinsure Wales Rally GB when, for the first time ever in Britain, public roads will be closed for FIA World Championship motorsport. 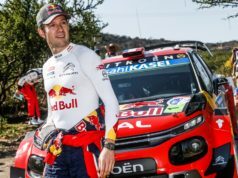 He became the first British driver to win on home soil since the halcyon days of Colin McRae and Richard Burns. Evans also was the first Welsh driver ever to win a round of the premier World Rally Championship. In an effort to keep the coveted gold Peall Trophy in Wales, the light-hearted viral film sees Evans receiving special instructions by well known Welsh television personalities Emyr ‘RoboNavo’ Penlan and Howard ‘Foodie’ Davies. Both pranksters are presenters on S4C’s Ralio+ programme. Davies is the popular show’s pundit having won the 1996 MSA British Rally Championship. 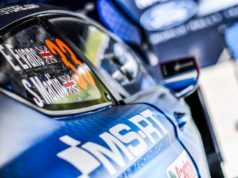 Then he was the co-driver to Elfyn’s father Gwyndaf Evans. But clearly, he possesses precious few orienteering skills. The pair jumps aboard a sporty Ford Focus RS. And the hopelessly loses itself on the seaside resort’s roads. They end up lapping the same roundabout, driving onto Llandudno’s Grade II listed pier and even into a McDonald’s drive-thru! Meanwhile, Davies, hardly himself a paragon of athletic fitness, appoints himself as Evans’ dietician. The aim is to rescue the rally star from the temptation of any of the culinary treats on offer to visitors in Llandudno. And as viewers will be able to find out, it doesn’t end well!